If you have temporal tables with date ranges, and you are sure those date ranges cannot overlap, then you can join them using the technique in my previous post – with a few important changes! Basically, every line in the table becomes two lines: the first line has the FROM_DATE value; the second has the TO_DATE value and it “starts a gap”. I don’t like this code, because it scans the table twice. You can integrate this with my “join” techniques by making one complicated SELECT, or you can create a VIEW based on the above code and just use my previous technique as is. You may remember that in my previous post, my tables did not always have two rows per “virtual range”. The same row could be the start of one range and the end of the preceding range. I could not have two rows with the same CASE_ID and FROM_DATE because of the primary key. Man, that is all messed up! Not only is row 3 unnecessary, but it’s telling us that the previous row stopped at the same time it started! Fortunately, we don’t have to do any extra work to get rid of that row. All we need to do is adjust the order of the rows in the previous techniques: ORDER BY FROM_DATE, START_GAP DESCENDING. Now that extra row will end a range and the next row will start a range, whether the FROM_DATEs are the same or not. This series of posts has focused on temporal tables that should not allow overlaps. The easiest way to avoid overlaps is for each row to store a date, not a range. A flag says whether the date is the start of a range or the start of a gap. When there is no gap, the end of a range is simply the date in the following row. Whether you use this design or store date ranges, the above solutions will allow you to “join” two temporal tables – as long as there really are no overlaps. In my previous post, I showed a way to implement and join temporal tables when there are no gaps, overlaps or null values. Let’s see what happens when I allow null values. I’m going to recreate the same tables as in my previous post, except that A_STRING and B_STRING are null in the second row of each table. This solution doesn’t care about A_STRING or B_STRING being null, so it works just as well now as it did before. My analytic solution used the IGNORE NULLS option – and that’s exactly what I can’t do now! Previously, a NULL in A_STRING just meant this was a B row. Now it can also mean an A row where A_STRING really is NULL. Since NULL can mean two different things, how do I distinguish the two meanings? The only way I know is to keep NULL when it’s a B row and use something else to stand for a NULL value in an A row. (see lines 4 through 13). So far, so good: we can define temporal tables that allow neither gaps nor overlaps, and we can join two such tables using MATCH_RECOGNIZE – or analytic functions if the database version is less than 12c. The data can include null values when necessary. What we cannot do is handle gaps, or even say that some object “no longer exists”. The latest row is always valid until the end of time. In the next post, I’ll try to add support for gaps while preventing overlaps. In my presentation at UKOUG Tech 15, I explained that temporal tables with date ranges are very hard to manage. One way to simplify things is not to store date ranges at all! 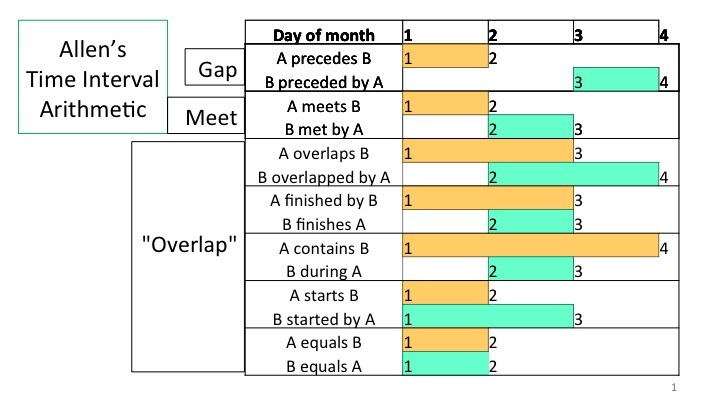 In this post, I’ll explain how to join two temporal tables when there are no gaps, no overlaps and no nulls in any column. Dr. Allen’s Time Interval Algebra refers to “time intervals”. The SQL:2011 standard refers to “time periods”. I talk about “date ranges” simply because it is a more popular search term – forgive me! Anyway, for my purposes they all mean the same thing. Although only the day of the month is shown, the boundaries are actually points in time, at exactly 12 A.M. each day. Notice that the start time is included in the interval, but the end time is not. This allows two intervals to “meet” at 12 A.M. without overlapping. But: how do you say that overlapping date ranges are not allowed? How do you say that gaps are not allowed? These are examples of “cross row” constraints that are very hard to implement successfully. The simplest way to implement such constraints is to store FROM_DATE only, and calculate TO_DATE! That is what I mean by “virtual date ranges”. Let’s take a very simple example to illustrate. Note that none of the columns can be NULL, that’s important. When two date ranges “meet”, the TO_DATE is always equal to the following FROM_DATE. So why store the TO_DATE? Just use the LEAD() function to get the TO_DATE from the following row. It’s so simple. After testing, it seems that UNION ALL uses about half the CPU of the FULL JOIN. This is not far from the answer we want. We need to “carry down” A_STRING and B_STRING values to the null columns in the rows below. Fortunately there is an analytic function that does just this: LAST_VALUE() with the IGNORE NULLS option. Once we do that, we just need to get rid of an extra row. The MATCH_RECOGNIZE clause lets us assign labels to the A and B rows so we can put columns from two input rows into one output row. In the MEASURES clause, A.<column> always refers to the most recent A row and B.<column> always refers to the most recent B row. The PATTERN looks for exactly one match, with as many consecutive rows as possible, and where every row is either A or B. Since B is not defined explicitly, it defaults to “always true”. It’s like an invisible “else”. Since I say ALL ROWS PER MATCH, all the input columns show up in the output of MATCH_RECOGNIZE. That is why I have to rename A_STRING as ASTR: otherwise I would get an “ambiguous column” exception. The output is exactly the same as from the analytic solution. There is no way to say that a CASE_ID does not exist anymore! It always exists from the latest FROM_DATE until the end of time. In the following posts, I’m going to overcome these limitations, but be warned: the solutions are going to get more complex.